First, I want to thank you for the warm welcome I have received as the new Main Street Manager. It’s been an exciting and challenging role to take on, and I have received so much help and encouragement from the community. Before I get into the details of the past year, I’d like to take a moment to review FrostburgFirst’s mission. As a Maryland Main Street Community, FrostburgFirst is part of a state-wide and in fact, a national organization focusing on the revitalization of Main Street and downtown districts. 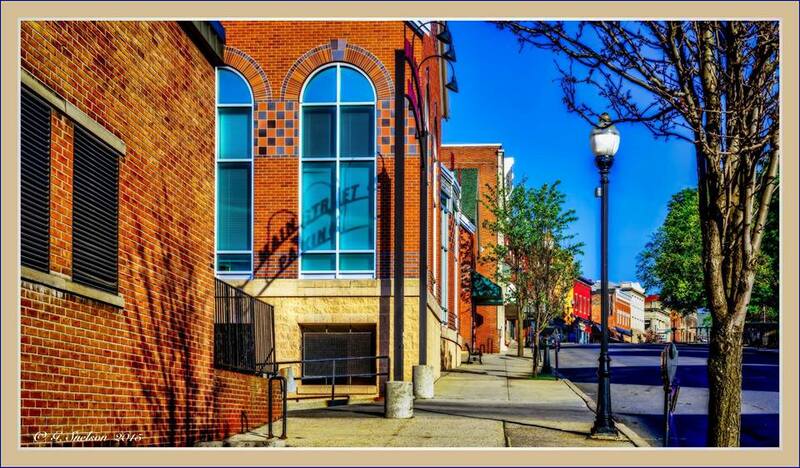 The goal of this revitalization in Frostburg is to engage the community, enhance streetscape aesthetics, promote small businesses and local shopping, and organize events and volunteers to make Frostburg a wonderful place to live, work, and visit. By implementing the Main Street Approach, FrostburgFirst strives to help transform Downtown Frostburg through promotion, design, organization and improving economic vitality. This is why your membership is so important. Without the engagement and participation of the community, local businesses, and organizations, this ongoing transformation cannot reach its full potential. Your membership is a key part of our revitalization efforts and provides you with the opportunity to have even more of an impact. Design: Plan public improvements & provide design education and technical assistance. Promotion: Develop marketing strategies and enhance Frostburg’s image. Organization: Raise money for activities & promote FrostburgFirst in the community. Economic Restructuring & Development: Create incentives and strategies for development. Now onto the 2017-2018 year. Of course, having joined the FrostburgFirst team in April, I can only convey the hard work of the previous staff. These achievements belong to the prior Main Street Manager, Jessica Palumbo; the previous Assistant Main Street Manager and Interim Manager, Bethany Doyle; the current Assistant Main Street Manager and former board member and Treasurer, Clare Buckle; and of course the efforts of the Board of Directors. Small Business Saturday & Handmade Holiday: 20+ Downtown Businesses participated, and at Handmade Holiday 14 local vendors registered. Arts Walk: 30+ Businesses, Organizations & 50+ Artists participated! FrostburgFirst also participated in and assisted with other community events, including Pirates Ahoy!, Block Party, Storybook Holiday, and Beautify the Burg. Welcomed 11 new members for FY 2019. Completed the 2017 grant to replace 72 banners in the Main Street District (Depot, Main Street, Water, Broadway). Frostburg named a Sustainable Maryland Community (City of Frostburg & Mountain Maryland Solar Co-op). Successful events & marketing/promotion for FrostburgFirst and members. As we look forward to the coming 2018-2019 year, there are several exciting projects on the horizon, including exploring FSU student engagement initiatives and increasing Main Street/Downtown Frostburg’s presence at the Frostburg Depot in order to encourage tourism. This summer also sees the start of a new signature event: Pig Out in the Park, a Kansas City Barbecue Society-sanctioned Backyard Barbecue Competition and festival. Taking place at Hoffman Park on August 18, from 1 pm – 8 pm, the event will feature the barbecue competition, live music, beer tent, Piglet Pen Kidzone & “Olympigs,” local artists & craft vendors, food vendors, and even a kids barbecue contest. Sponsorship opportunities are still available for this event, so please visit pigoutfrostburg.com for more details. So, as we move into the new year for FrostburgFirst, consider how you can get the most out of your membership. By joining a committee, you have the opportunity to have direct involvement with FrostburgFirst events, provide input on organizational operations, proposed projects, and membership incentives, and increase the visibility of your business or organization in the Frostburg community and throughout the region. FrostburgFirst thanks you for your continued support, and I look forward toworking with you to accomplish our mission of developing and fostering a prosperous,vibrant, sustainable, and resilient designated Frostburg Main Street Community.